Fiduciary duties for the top governance officials of both business and religious organizations demand faithfulness to the institution’s mission, a seemingly strict demand. Meaningful sanctions for breach, however, are difficult to obtain and may not deter future misconduct, including that kind of conduct leading to organizational bankruptcy. This article advocates that, to attain both special and general deterrence, bankruptcy law should look to other regulatory regimes and permit a bankruptcy court to debar faithless secular and ecclesiastical fiduciaries from holding certain leadership positions. Although written shortly before the 2012 Supreme Court Hosanna-Tabor decision, that opinion – addressing the “ministerial exception” for employees − does not alter the constitutional assessment of the position argued for in this article with respect to harm-causing, non-ministerial governing officials. "This article was originally published in the ABI Law Review, Vol. 19, No. 2, Winter 2011, and is archived with the permission of the American Bankruptcy Institute (www.abiworld.org)." "This article was originally published in the ABI Law Review, Vol. 19, No. 2, Winter 2011, and is archived with the permission of the American Bankruptcy Institute (www.abiworld.org)." Lyman P.Q. 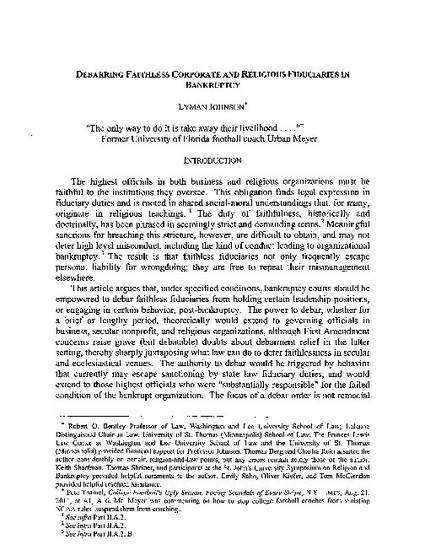 Johnson, Debarring Faithless Corporate and Religious Fiduciaries in Bankruptcy, 19 Am. Bankr. Inst. L. Rev. 523 (2011).